It’s a Friday. I’m sitting in my dad’s RV in southern Arizona, where the weather hovers at a dry, constant 90 degrees. Coconut ice cream drips from my spoon, and I’m contemplating the incredible fact that I should be somewhere in New Hampshire right now. But I’m not. Plans have changed (they’ve changed so much) from our original Appalachian Trail trajectory, leaving me in an RV. Roasting. Shoveling cookie dough chunks out of a melty cardboard container. 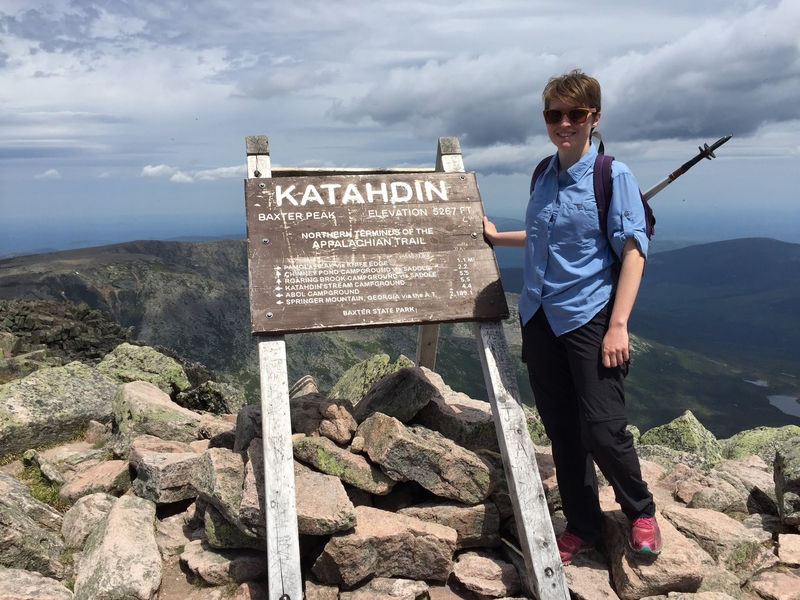 I think about the fact that, three weeks ago, I summited Mount Katahdin, placed my first step on the AT, and went SOBO. I think of the sweat that oozed from my body in the heat while my husband (aka Pegleg) and I bouldered down Hunt Trail—and the blood that oozed from my leg when my shoes lost their grip on a steep decline. I remember the days of filtering sediment from questionable water sources, the way my calves turned into cacti, the maddening burn in my thighs each time I had to climb up yet another mountain in the 100-Mile Wilderness. And yet, it didn’t last. Instead of spending 180 days on the trail like we planned, Pegleg spent four, I spent nine, and then our shot at the AT ended. Just like that. After the mononucleosis fiasco of February 2018, when I came down with mono at 25 and made the decision to sell our house and hike the AT with Pegleg if I got better (everything seems a little more dramatic when you’re sick, you know), we put our plans in motion. We scrubbed up our abode, donated almost all our belongings, temporarily relocated our cats, broke the news to our families and friends, and accepted an offer on our house. Fate (or luck, whatever you want to call it) was on our side. Then, I tried to quit my job. Our post-AT plans had always been to relocate to Washington state. When I told my employers that, they countered by offering me a remote position with the company. Boy, did that complicate things. Unless you’re an entrepreneur or run your own business, the ability to work remotely is a gift not many people are given. If I accepted, we’d be able to move to Washington no problem, our finances wouldn’t be a wreck from seven months of unemployment, and Pegleg would be able to solo hike the AT with proper health insurance. They even offered me a month off, for relocation purposes, so I did the responsible adult thing (or so I thought). I accepted. While I gave up the AT for this year, Pegleg followed our original goal. He quit his job, tested his gear, and situated his first three weeks of food. Then, we piled in the car and drove to Maine. Since I had the month off, I figured I’d hike the first 114 miles with him, then drive across the USA to Seattle just in time to start work again. Everything was perfect. Or… it was until it wasn’t. 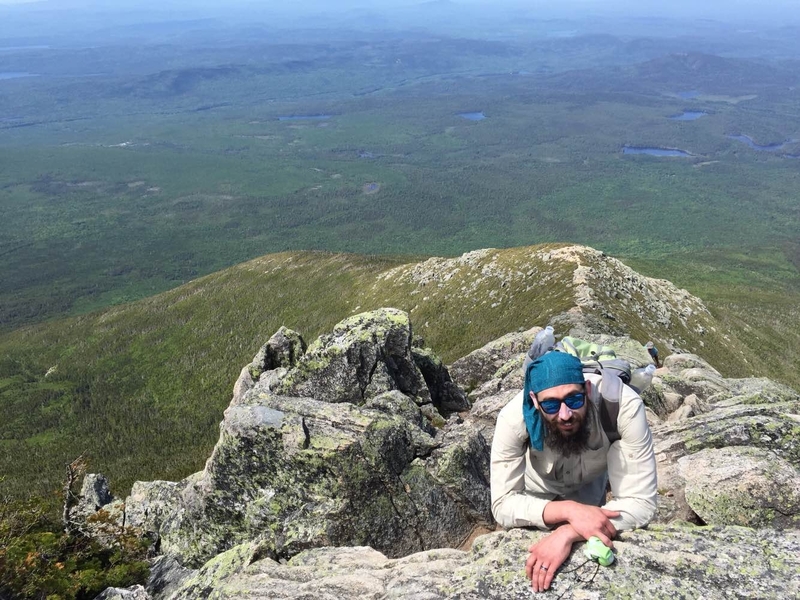 On our way up Mount Katahdin, a heavy water bottle fell out the side pocket of Pegleg’s day pack and nailed his foot. It didn’t hurt too much at first. We thought he’d just bruised it, so we shook it off, laughed, and continued along the trail. But over the next two days, we watched in horror as it blackened and swelled. The pain went from a dull throb to a sharp knife between his toes. 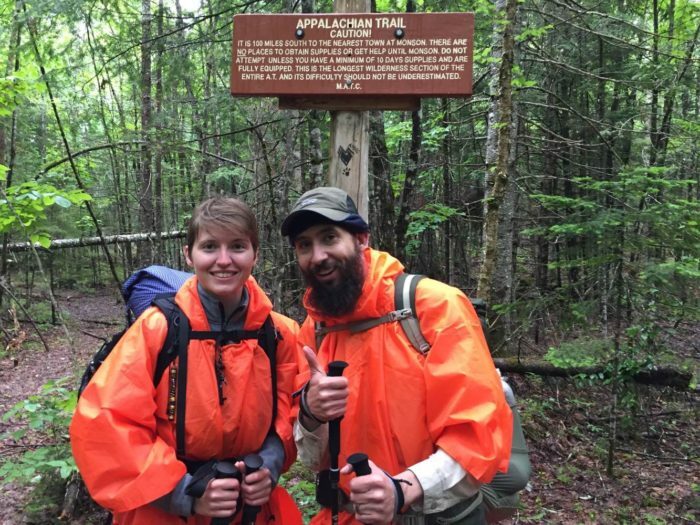 Every step in the 100-Mile Wilderness was torture, and the only relief was aspirin. Over and over again. 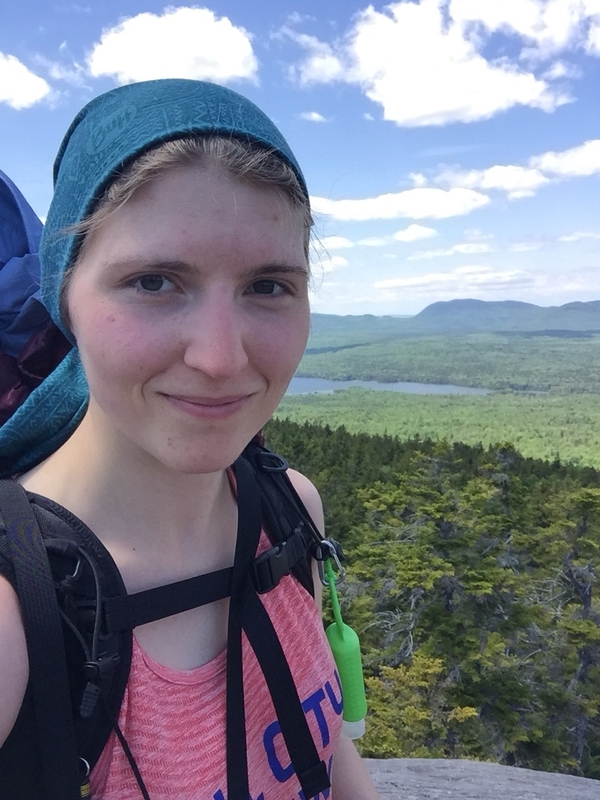 At the peak of the next mountain, we called the AT Lodge in Millinocket and asked them to pick up Pegleg from the nearest road, another eight miles ahead. That night, we laid carefully in our hammocks, frozen by the mosquitoes that swarmed around our bug nets like a demon horde, and talked about the future. Pegleg was pretty sure his foot was broken, judging by the stabbing sparks that radiated up his ankle with every step. We didn’t discuss it then, but we knew the AT SOBO dream for 2018 was dead. He wouldn’t be able to continue without healing first (he’s a slow healer), and I’d already given up my shot for my job. But as I lay there, listening to his quiet breathing, it distressed me to think I’d have to get off the trail with him, essentially letting go of my thru-hike dream and my section hike dream. I could still make it to Monson, I thought, even if I were alone. Right? I’d never slept a night in the woods without Pegleg and barely knew how to hang my bear bag, but I could do it. The next morning, I did what any selfless wife would do in this situation. I asked Pegleg if I could keep going and meet him at Shaw’s Hiker Hostel in Monson. And, to my surprise, he sent me on my way with a squeeze, and a kiss, and encouragement in his eyes. I hit the trail running after adjusting my pack and finding some nearby water to filter. For the first four hours, I navigated the woods alone, only pausing to eat two handfuls of trail mix and pee behind a tree (boy did I pee way more often on the trail). Then, around noon, I caught up with the group we’d said goodbye to a couple days before. With Pegleg’s foot, they’d outpaced us. But alone, I could now keep up—and even lead them. The next six days in the wilderness brought me a bliss, clarity, and strength I didn’t have before. I dug a cathole for the first time and learned how to wipe with leaves and fronds (I’d only brought a few squares of toilet paper with me. Oops). I streamlined my pack, able to set up in the evenings and tear down in the mornings with ease, often before anyone else had. My shoes filled with water at every river crossing, and the soggy squish, squash of my steps through the woods made me laugh. A giant toad tested my reserve, eight spiderwebs smacked me in the face on my way up Barren Mountain, I experienced an ache in my knees I’d never before known, and I craved a cold Coca-Cola like no other. Then, there was my brief trail family of four. I learned to rely on strangers and let go of the shame of getting my period on my fifth day on trail. We shared food, toilet paper, hot chocolate, and inspiring conversations around our campsite every night. In the morning, we embraced the bed heads, smelly clothes, and blister popping as if we’d known each other forever. When I finally reached the end of the wilderness, successfully completing 114 miles in nine days, I felt more love, joy, and meaning in my life than I ever had before. And those emotions gave me a keen sense of loss. Knowing I had to let go of the AT and leave my brief tramily behind… knowing I wanted to quit my job right then and there and keep going forever but not seeing that as good timing for my family… it sucked. I had to make the adult responsibility again. I had made commitments for the rest of the year that wouldn’t allow me to chase the wild. But I would, I told the woods. I would chase it soon. And I would do it with purpose. On a sad Monday, after two days of rest at Shaw’s, Pegleg and I climbed into our car and drove. Washington was another dream we had to give up in the aftermath of his fractured (thankfully, not broken, according to the E.R. nurse) foot, so we found ourselves in Arizona, where we’re wallowing in the heat of my dad’s RV, not quite sure what our plans are. Even though we tasted our dream of the AT and had to let it go, we’re choosing to see the positivity of this failed attempt. It’s given us a level of flexibility we didn’t have before. It’s given us time, control, a fresh budget, and fresh eyes. The first 40 and 114 miles we hiked were little shakedowns, allowing us to learn a lot about how we respond to pouring rain, wet hammocks, blisters, tangled cords, mosquitoes from hell, too much trail mix, sore knees, heavy packs, itchy clothes, and mismatched pacing. We’re going to take this knowledge and, throughout the remainder of 2018, tweak our gear, test hiking recipes in the kitchen, and go on more practice hikes (mostly so Pegleg can ease back onto his feet). This year’s attempt prepared us for the reality of the trail. We’ve received a taste of what to expect and how our bodies need to be treated. Very valuable information. And then, in 2019? I’m going to return to the trail, alone, and hike NOBO. Meanwhile, Pegleg will start a section hike of the Arizona Trail, with a goal to complete it in 12 to 18 months. We can’t wait to get back to it. The magic of the trail—any trail—just isn’t something you forget. 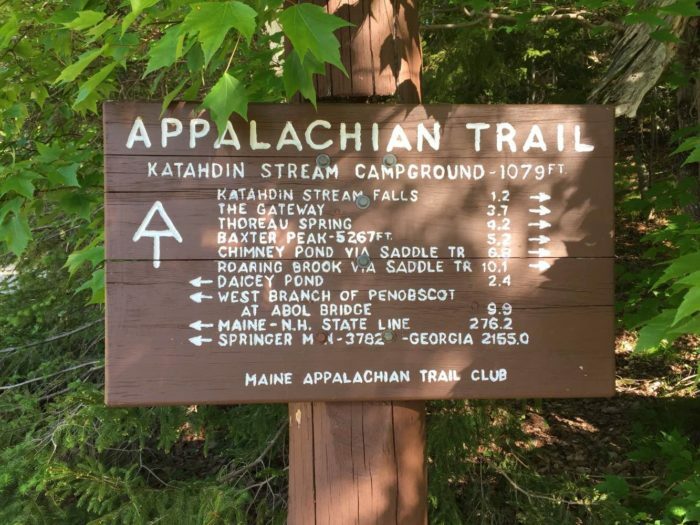 I wanted to share our story with others because, as we’ve come to learn, many hikers start a trail like the AT with a goal to finish it, only to be thrown off somewhere between the beginning and the end because of an injury, depleted budget, or family emergency. The allure of the AT shouldn’t be understated. If you want to do it, do it. Don’t let anything stop you from getting there. But no matter how much you want it, sometimes the trail throws you curveballs as a way to test your patience, your will, and your flexibility. We could’ve clung to the AT this year, kicking and screaming and thrashing, and we would’ve had a terrible (and painful) time. Instead, it said to us, Go figure things out, heal up, and come back next year. I will still be here. I will still embrace you with open arms. There is still time. Letting go is hard to do. Trust me, I know. If the AT has been a goal you’ve long had, it can be disheartening to be thwarted from the journey in the first week, or the first month, or even miles before the end. Everything is supposed to go like you planned, dang it! But sadly, the world isn’t always kind… at least not in the way we expect. Which is why we’ve put our hopes in the flexibility that not going has given us. Flexibility has given us thankfulness for what we could do, understanding about the actions that led to leaving the trail, and excitement to try again the next year. During our brief adventure, we met a lot of amazing folks. One hiker told us this was his third attempt on the trail. He didn’t let a broken wrist or family events stop him from trying, trying again, and it inspired us. If he can come back a third time and not bat an eye about his previous roadblocks, we know doing the same next year won’t be so bad. Not everyone can do the AT in the first shot—and that’s no one’s fault. Don’t let your failures stop you from chasing the magic. We certainly won’t. Injured my knee on Katahdin in ’16. Made it to Hurd brook shelter. Stopped, did pt for a year, went back last year and made it to Bennington, VT. Picking up again in a couple of days. Sometimes the journey follows a different path than what we imagine. Good luck in your quest. Fair winds and following seas. You made the right decisions along the way. The AT can definitely throw some surprising punches and teach us humility. I was taught this last year after 500 miles. I’ll probably be like the fellow you met who was on his third try. I’m having to sit this year out because of physical therapy, but hope to hit the trail next year, taking up where I left off. Good for both of you for already have plans made for next year. The trails will be there for us all! Best of luck. just wondering what kind of training your doing. I plan to run A couple of marathons before I begin the hike and definitely strengthen my core. Squats squats and yes even more squats. 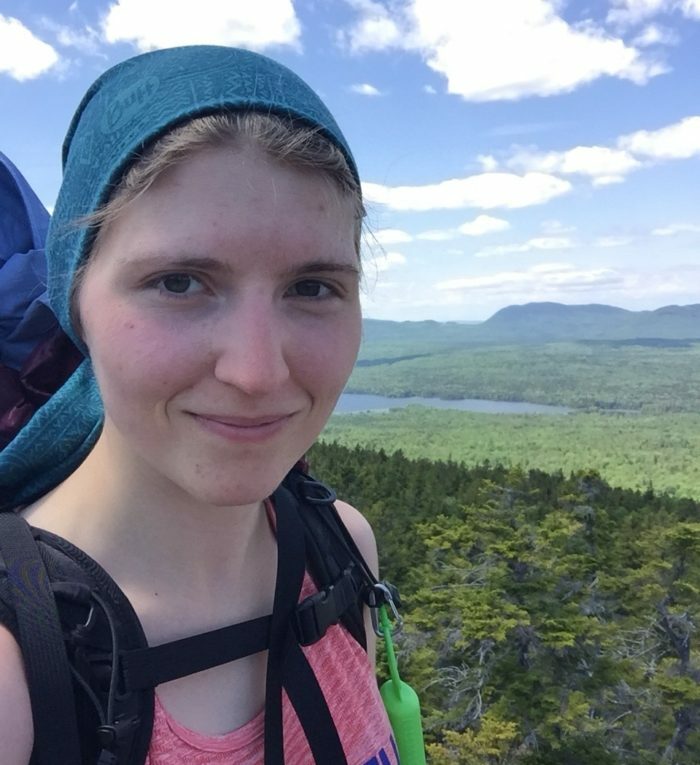 Hi Chris, I think you meant this question for Ruth, but if it helps: we’re planning on doing several 3 day hikes up and down mountains (as the mountains in Maine kicked our butts since we were unprepared) with our packs at their full weight. We’re also running 4x a week to keep up our stamina, and I like doing yoga to build stability and balance (helpful on some of the ups and downs with a heavy pack on). If you’re not near mountains, I would highly recommend doing stair climbing along with the squats to build those leg muscles. – Just a word on training, though. Preparing your body and strength certainly helps, but we saw people on the trail who went to the gym every day before the hike and still got their butts kicked by the length of days and weight of their pack. There’s a level of preparation that can go in pre-trail, but I still think the AT has some secrets you won’t discover until you’re there. 🙂 Which is pretty cool. Enjoy the journey! What a beautiful post. I didn’t get to finish my thru-hike of the Wales Coast Path and even though it frustrated me and made me sad at that time, I still think I took the right decision stopping the hike. Reading this post I think you too made the right decision. Like you said, the trail isn’t going anywhere. Thanks for writing this Katniss. So many had to get off this year because if awful weather down south. But the trail ain’t going anywhere! Hope to meet you as you continue!